Much like its predecessor, the new M5 is a beefed-up version of the standard sedan as far as exterior design goes. So if you dig the new 5 Series, you’ll definitely love the M5 and its sportier cues.Revision are pretty significant. Not only more aggressive by looks, the M5 is also more aerodynamic. The front section features broader fenders, while the larger intakes in the bumper feed more air into the engine’s cooling system and the front brakes. The double vertical slats in the grille are finished in black as usual, but you can opt to have the entire grille (along with the window trim) in black by selecting the optional Shadowline package. The engine hood also has an M-specific design, featuring more creases for a muscular look. What’s more, it’s made from aluminum, which together with the carbon-fiber-reinforced plastic (CFRP) roof shave a significant amount of weight off the standard 5 Series. And of course, contribute to making the new M5 lighter than its predecessor.Onto the sides, we can see the usual M-specific wheels that hide M compound brakes, revised side skirts, and a lower ride height. Around back, there’s a fairly big diffuser flanked by two exhaust pipes on each side. As usual, there are plenty of “M5” badges to let onlookers know that this isn’t a regular sedan.Overall, the new M5 design’s boasts many improvements, but I feel like BMW didn’t try enough. Especially when compared to the AMG E63. Extremely aggressive exteriors are a total treat. However the interiors miss the wow factor. It is heavily borrowed from the 5 series, which has its highs and lows. The Highs are the interiors of the M5 are not very dramatic so even the matured buyer can opt for it. The lows are since the interiors are very reminiscent of the 5; there is nothing refreshing about it.M5 badged scuff plates welcome you inside the cabin. The Merino leather upholstery is just fine and is extremely comfortable. Even though the M5 is a performance sedan, the seats are still very comfortable unlike the 2012 BMW 328i, which has extra bolstered seats. Legroom is comfortable for the front row and decent for the rear. Perhaps guys at BMW knew that a M5 customer will not be spending too much time at the rear seat, which is so true. The M badge affixed and custom stitched Nappa leather steering wheel has two M mode options M1 and M2 on it which can be manually configured for performance and comfort settings respectively. Instrumental cluster is simple and stylish. I have a small complaint with the 2012 328i and now this one too which is the digits on the speedometer and tachometer, this is perhaps I want the car to be as sporty and aggressive in the interiors as well.Aluminum finished paddle shifts, right for up and left for down are just behind the steering wheel. They provide proper grip and also help to give a performance sedan feel to the driver. The heads up display is a standard arrangement on the M5. Around the staunch M auto shift stick, there are 3 custom engine performance options Effeciency, Sport and Sport Plus, which tweak the ride according to the desired condition. These modes are highly active and one can notice it as soon as it is activated. For example, as soon as it is shifted in the sports mode there is a noticeable rise in the engine rpm.The front door pockets can hold a 1L bottle easily. Also there are many intermittent storage options on the central console and also on the rear row of passengers. The boot space of the 2012 BMW M5 is a generous 520 litres. This is a lot of boot space for a sedan like this. There is no change to the powertrain options with the facelift. The twin-turbo 4.4-litre V8 continues to power the M5. The growly beast develops 568PS of power and 680Nm of torque at just 1500rpm delivering performance in a very non-turbocharged manner. Just the fact that there is about 2 tonnes to carry along makes the shove from motor even more dramatic. 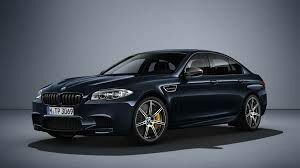 Full bore acceleration pins you in the seat as the M5 squats on its rear axle before surging forward in one relentless motion. Even in the rain, with the electronics turned on, for a RWD car, the stability and composure at speed is mind-boggling. Absolutely no snaking around and very little cut in power as action on a wet surface too is ample. The M5 can do the 0-100kmph run in a officially claimed 4.3 seconds and top speed is a achievable 300kmph on a fairly long stretch of road. Its the way the M5 accelerates beyond the 150kmph mark that is a bit weight defying. The seven-speed dual clutch transmission works perfectly well providing a clear demarcation between its various modes from smooth and docile to downright violent. It allows the joys of having both in caged harmony to characterize the shades of the M5 as a commuter or a sportscar.